Hi everyone I hope that you are all well and happy. Today sees the launch of the brand new Home Tweet Home kit available over in the store. This kit is in my opinion one of the best yet there is so much there you would never be without inspiration and stuck for ideas in fact the inspiration for the kit came from our very own Marleens curtains lol . I was one of the lucky few to get the kit before its launch and I have a project or two underway that I will be sharing with you soon but for now I would like to share with you a wall hanging I have created and I hope that you like it. Pop over to the store and check out this gorgeous kit , theres something there for everyone. Hi Tina, as I type this comment Fluffy is sat watching me type this and purring her little head off. She sends you lots of meows and purrs. This is fabulous, love it. Lovely, great image and papers. 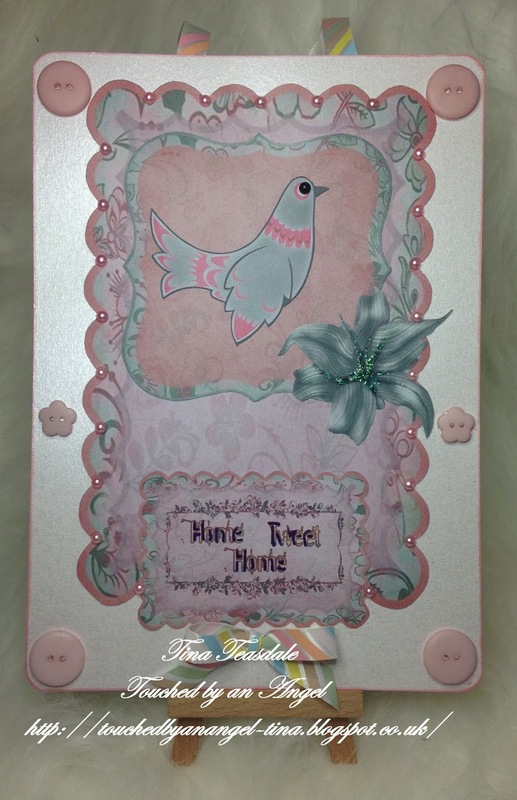 You've made a really pritty card with the lovely new kit.